Last month I was guest to an event, hosted by the Rabobank; the Dutch cooperative agricultural capital provider. I was there to informally launch a masterclass in business model innovation for the Dutch greenhouse horticulture sector (formal details will follow in the coming weeks). At their headquarters, the Rabobank also happened to be hosting an art exhibit called “Daily Future” by the artist Alicia Framis: an interesting exhibit provoking the imagination of what life would be like on the moon and how the moon would function as a hub in intergalactic travel. A marketing manager for Rabobank in The Netherlands gave me a tour and provided intricate insights into the artist’s project. During our walk-about we came to discuss why a bank would host such exhibits in the first place. I was pleasantly surprised to hear that the bank chooses such exhibits to make a statement and provoke reaction from the public on the bank’s position in society, in order to reflect on the bank’s own conception of the same. By choosing for the current Daily Future exhibit, the bank encourages people (read customers) to think on what their future would look like, the kind of investments they would want to make to reach that future, and engage in conversation with the bank on that basis. This is a very compelling thought. The Rabobank is the chief financier for agriculture and food industry in The Netherlands, and among the leading banks in this field, globally. It is funding the future form of agriculture and food, and as such appears to be actively provoking divergent thinking. My tour guide told me that the bank recently invited groups of horticultural producers to the exhibit to invite their opinion. Nearly all dismissed the concept as being too vague, meaningless, and uninspiring to their reality. Reflecting on our project for the horticulture sector, the challenge dawned on me. The horticulture sector is under the weather, and in much need of new entrepreneurial impulse. I thought it was a part of a lucky spell that the bank funded our proposal to conduct a business model innovation masterclass series with their clients. But as it turned out the idea fit right into the core of the issue with which the bank is struggling, namely rescuing a declining industry. I found it a very inspiring realization. The phenomenon of the connected company is pivotal to the age of value chain generation. Companies, like Rabobank, are increasingly sending out invitations to their stakeholders to engage with them on designing the future together. Just have look at Marks and Spencer’s Plan A, or Unilever’s open innovation initiative. Such initiatives can be framed as first steps to creating the connected company, a big idea! In order to succeed, it is the responsibility of the company to make engagement meaningful through empowering their employees in the conversation, enabling them to translate outcomes into purposeful action. 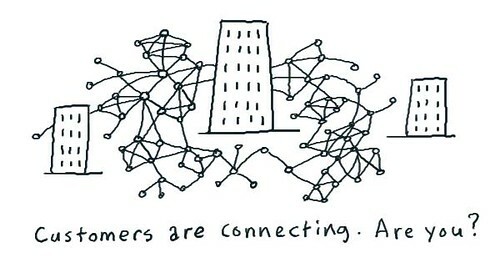 At the same time the connecting company is an opportunity for the (outside) change agent to take on the invitation. They must sense the underbelly of why companies are sending out these invites, and work out a way for constructive contribution to solving the problem of the corporation that is seeking to reconnect with its’ value chain community.